Ciate's colourfoil manicure creates edgy, cool gratified look with this easy to apply long-wearing manicure. 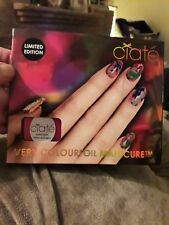 Ciate Very Colourfoil Manicure Set Girls Ladies Gift.. NEW *Limited Edition* . Condition is New. Dispatched with Royal Mail 2nd Class. Ciate Cavier Manicure Luxe. Condition is New. Dispatched with Royal Mail 2nd Class. CIATE Corrupted Neon Manicure- Club Tropicana. Ciaté Corrupted Neon Manicure Club Tropicana Gift Set. 10g Club Tropicana Neon Glitter 5ml Black Light Top Coat. The Corrupted Neon collection brings you the zestiest neon shades.